Not all of them would load (North Korean servers aren’t known for their speedy page delivery), but I got a few to fire up. First I played a geography game with a map of the Korean peninsula, the goal being to recognise each province and major city by its shape, and then stick it in the proper place on the map. I didn’t do too bad, despite my very limited knowledge of Korean geography! The premise is this: Japanese invaders have dug tunnels under your house, and are popping out of holes in the floor. Your goal is to push the rubies over the holes to keep the Japanese out. Plus there’s an extra twist: When you run over one of the Japanese with a ruby, they turn into a bruised-looking American imperialist! This is one of those games that is so simple, it’s hard. 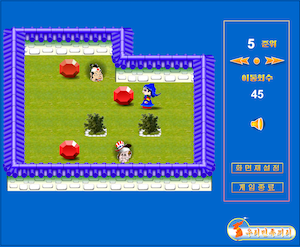 I got through the first three levels fairly speedily, but level four caused me much grief and frustration. And the game didn’t offer any encouragement—every time I worked myself into a corner, it would alternate the messages 머리가 나빠요! and 정말 아쉽군요! which roughly translate as “You’re so dumb!” and “Oh, too bad!” I consider myself fairly intelligent, but after trying to beat level 4 for half an hour, I was starting to believe it! Are you smarter than a North Korean schoolchild? I finally did beat level 4, but I have no idea how I did it. I just happened to finally make all the right moves, and now I’m stuck on level 5. 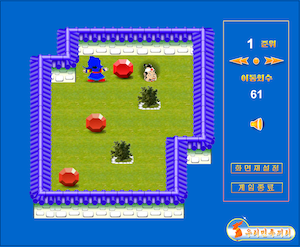 It makes me wonder if kids in North Korea play this game on the state-controlled intranet. I doubt this particular site gets much traffic—most of the content is written in Korean, and while the average North Korean has no Internet access, South Koreans are blocked from visiting North Korean sites as well. But at least I got a little bit of fun out of it, and maybe came to understand the North Korean culture a little better. Now if you’ll excuse me, I need to get back to pushing rubies over the heads of Japanese invaders!